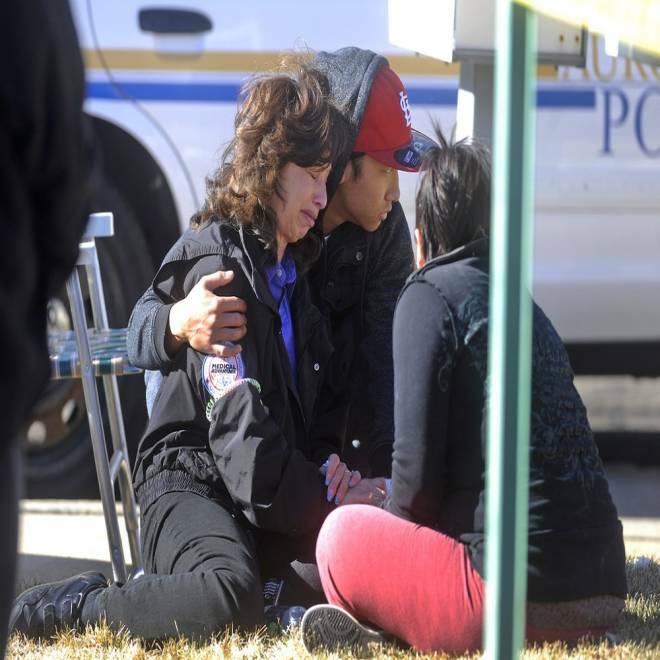 A woman reacts outside a townhouse complex following an overnight hostage situation in Aurora, Colo. on Saturday. Four people died including the gunman, according to police reports. Updated at 4:45 p.m. 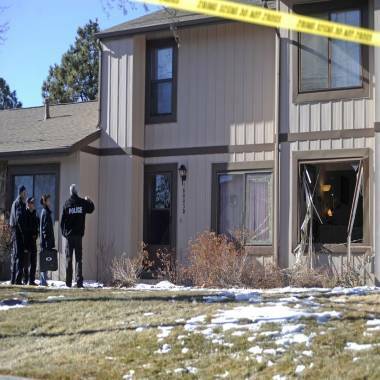 ET: Two men and one woman were found dead inside a home in Aurora, Colo., after a gunman took them hostage early Saturday morning, police said in a news release. The gunman was shot and killed by police after hours of failed negotiation attempts. Another woman who had been inside the house was able to escape uninjured and alert authorities, the news release said. The woman told police that an adult male still inside was armed and had fired shots inside the home. She said she saw three people in the home who appeared lifeless as she was leaving. This marks another shooting tragedy for Aurora, a suburb still reeling from the summer shooting in which a gunman entered a theater, killing 12 people and wounding 58 others. Residents in the city had just been debating whether the movie house chain's owner invited the victims’ families to a special event marking the Jan. 17 reopening, with some threatening to boycott the event. On Saturday, officers were called to a town home in the 16000 block of E. Ithaca Place shortly before 3 a.m. after reports of shots fired. Several nearby homes were evacuated for safety reasons and police sent out emergency notifications for the other residents in the area. Officers took positions around the house and attempted to get in touch with the gunman, the news release said. Hostage negotiators arrived at the scene and were able to establish phone contact with the shooter. A SWAT team was also called at the scene. Police survey the outside of a townhouse complex following an overnight hostage-taking incident in Aurora, Colo. on Saturday. Police said phone contact with the gunman continued intermittently in the following several hours. Several times, the man was told by phone and by bullhorn to emerge from the house, but he apparently refused. "He was behaving very irrationally throughout the incident and often hanging up on the negotiators," the news release read. Around 8 a.m., SWAT members moved to the front of the house to break out a window, which caused the shooter to fire multiple rounds that hit the vehicle but did not injure any officers. Police did not return fire, and shortly before 9 a.m., the gunman appeared in a second story window, firing again at the officers. Police returned fire, hitting the suspect, the news release said. Upon entering the home, police found the three deceased victims and the gunman was found dead in the upstairs bedroom. Aurora Police Department Sgt. Cassidee Carlson said no names will be released until the coroner's office confirms the identities. Meanwhile, a judge set a preliminary hearing for accused Colorado movie theater gunman James Holmes for Monday. The hearing is expected to last the entire week. Hundreds of people, including victims, their family members, and members of the public are expected to come.